Arnold Schwarzenegger, Michael Biehn, Linda Hamilton. Size: 27 x 40 inches (68.58 cm x 101.60 cm). Condition: near mint-mint and unused. 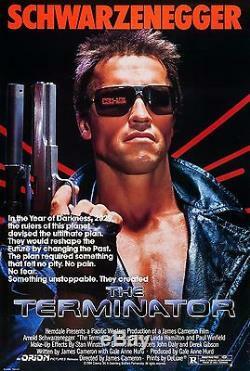 The item "THE TERMINATOR (1984) ORIGINAL MOVIE POSTER ROLLED" is in sale since Thursday, April 20, 2017. This item is in the category "Entertainment Memorabilia\Movie Memorabilia\Posters\Originals-United States\1980-89".